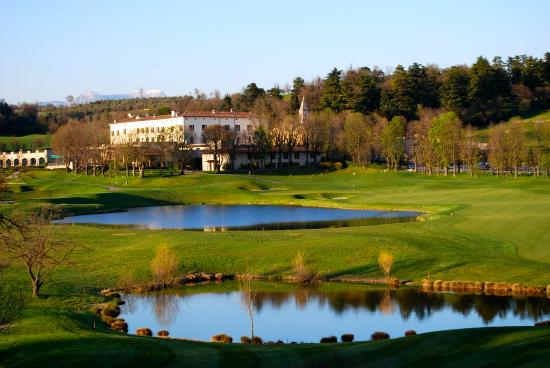 The beautiful Arzaga golf club is located in Northern Italy near Lake Arzaga. 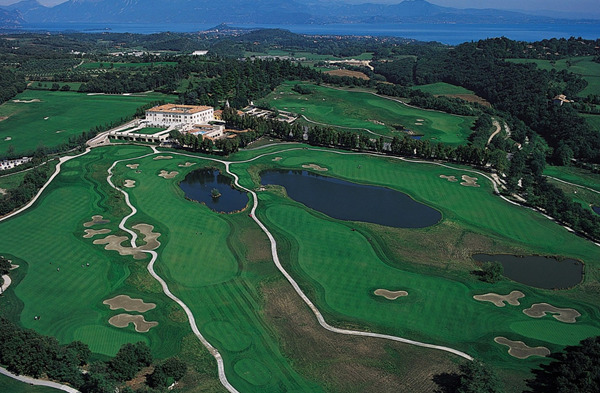 With two challenging courses designed by Jack Nicklaus II and Gary Player you can enjoy one of the best games of golf of your life while taking in the breathtaking scenery against the backdrop of the towering Alps! 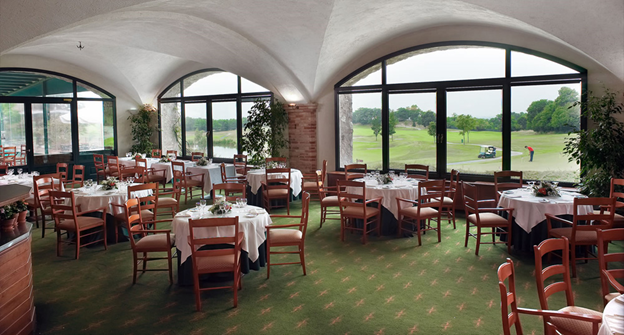 The Clubhouse features fine dining in the restaurant with sweeping views from the large windows. Take a look in the Pro shop where we have all the best brands to take your game to the next level. Our golf cartsfeature waterproof stereo systems like those found at Rock The Boat, to provide a spectacular music soundtrack to your perfect golf experience. 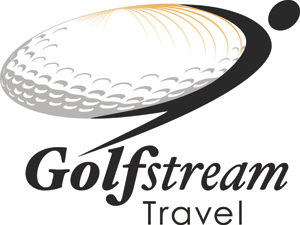 And our team of experienced caddies are always available to take you out for a game. 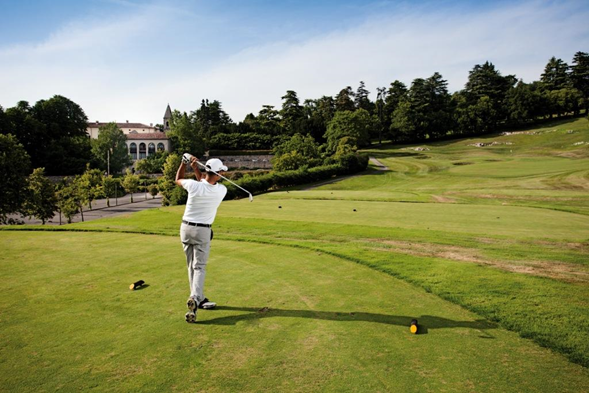 If you are an aspiring young golfer, or just want to perfect your game, you will want to visit the Arzaga Golf Academy which is operated by the Zappa family for more than two decades. They have helped some of the game’s brightest young professionals achieve their best. 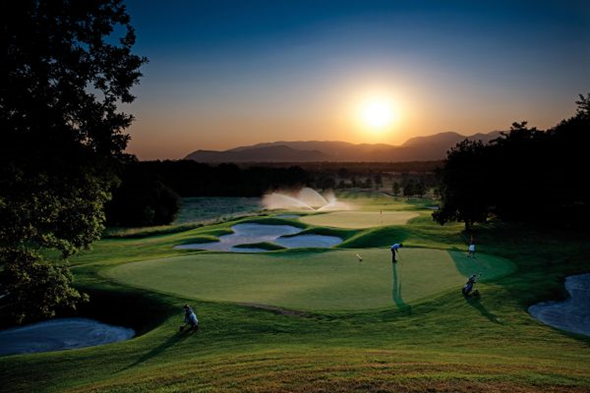 Our courses were designed by Jack Nicklaus II and Gary Player, 18 and 9 holes. Each requires a different strategy but both require a high level of play. The courses include five artificial lakes that require impressive skill to overcome. Enjoy the spectacle of nature, colors and light – rich seasons and winds typical of Lake Garda. The fairways run through hills and valleys, and form unique light and shadow, especially at sunset. Two outstanding names, two strategically different courses; require difficult decisions such as the Green is … birdie or par? Each iron in the bag can be played. A risky strategy can also be rewarded. Three individually decorated Suites all located on the Palazzo first floor overlooking the main entrance. They are all one-bedroom Suites with a king-size bed, a luxurious marble bathroom, a large living room equipped with 32/26 LCD television sets, DVD/CD/Radio home-theatre and Dolby surround system. The peculiarity of our Suites are the original ceiling paintings and trompe-l’oeil frescoes dated 1864. The new soft, fresh and high quality bedding gives a fresh look to the rooms and makes your stay more comfortable. Two very unique rooms located on the 1st floor of the Palazzo. 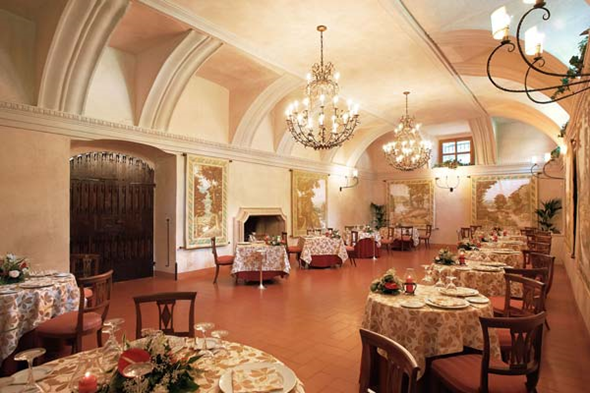 They are decorated with original XV-Century fresco walls attributed to Guido Reni’s School. The spacious rooms are fitted with king-size beds, they have an antique terracotta-tiled floor and enjoy views over the Jack Nicklaus II Championship Golf Course. 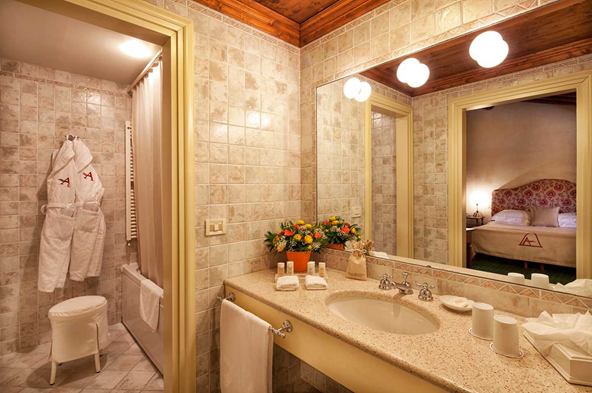 Fresco rooms are non-smoking and have a marble walk-in shower. 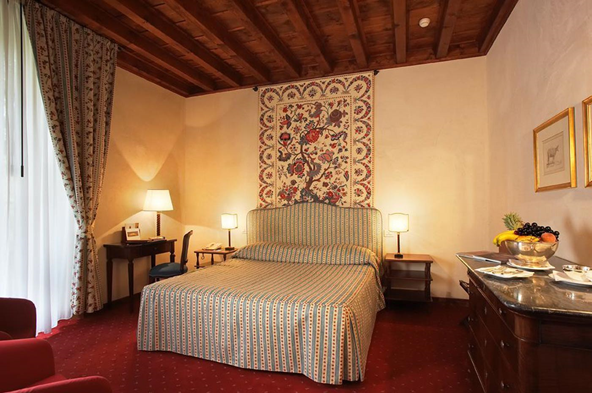 The spacious Executive rooms are located on first or second floor and have either bright high or sloped romantic wooden ceilings. All the rooms offer an enjoyable view: the golf course, the botanical garden, the driving range or the main entrance overlooking the Chestnuts Alee. Cosy rooms, most of them situated on second floor, with sloped wooden ceilings and with a view on the inner courtyard or the surrounding countryside and the golf courses. English Country style rooms with double or twin beds. 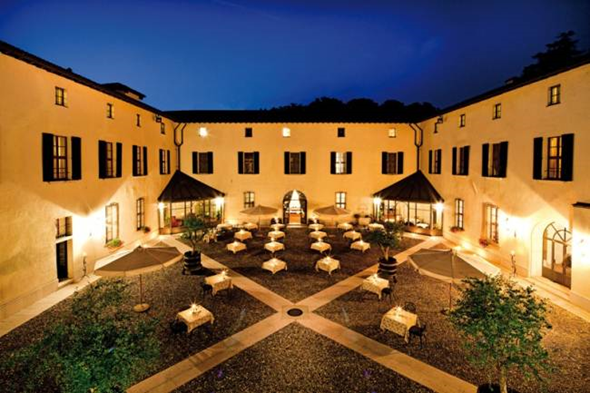 The twenty-two rooms are located in the Residenza I Castagni, thirteen of which have a discrete terrace or balcony with views over the local countryside and golf courses. 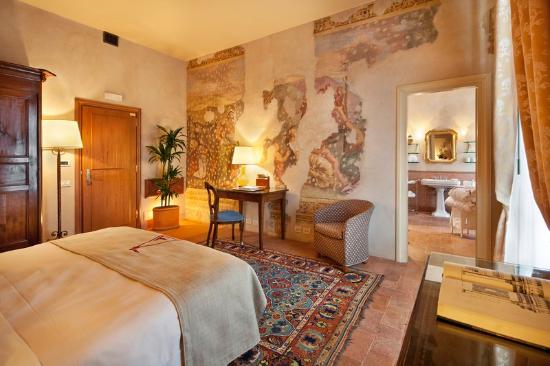 The English Country style rooms are located in the Residenza San Martino adjacent to the romantic Church. The interconnecting rooms are suitable for families. 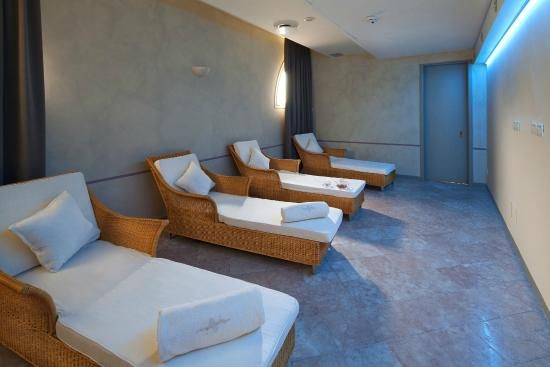 Arzaga Spa by Clarins is an exclusive place of pure relaxation and pleasure for the 5 senses, for those who like to rediscover time and who want to escape the rigors and stress of daily life it is a garden of tranquility and elegance, where to live an unique and sensorial experience. 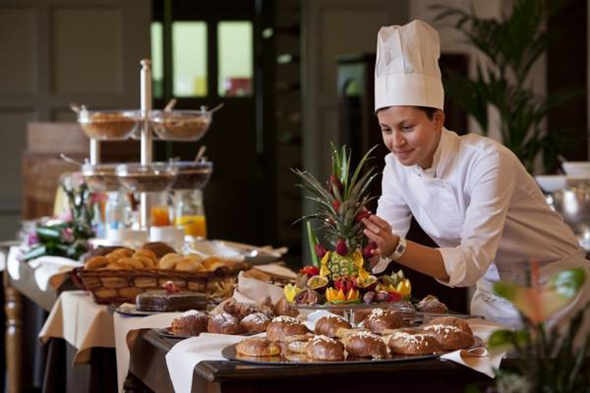 The guest is accompanied by our well-being experts along the most suitable path for achieving the balance. 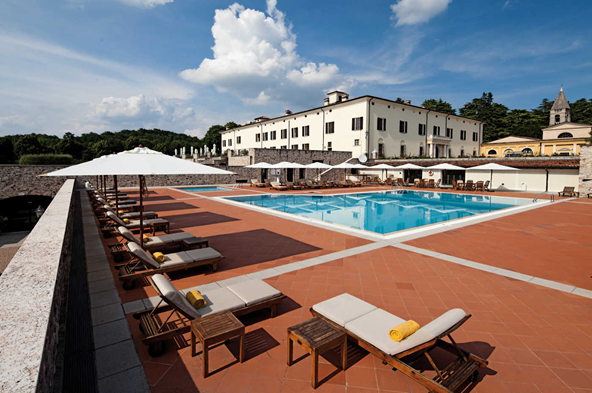 The resort’s tranquillity and peacefulness are protected by 150 hectares of nature that surrounds the property: the Pre-Alps behind the hills and Lake Garda at its feet. Outside this oasis: art, culture, entertainment, shopping and romanticism await you. A few miles away Lake Garda offers a wonderful lifestyle, both day and night; Desenzano del Garda is the main nightlife attraction, Salò is full of history, as well as Gardone Riviera with its “Vittoriale degli Italiani”, which is Gabriele d’Annunzio’s house and Second World War Museum, and last but not least Sirmione, with its renowed thermal baths. For those-who like sport: La Conca Verde clay Shooting Club, Fraglia Vela Sailing Club, South Garda Karting are just some opportunities, to be completed by many others including the cycling green ways around the Lake Garda. Beautiful cities are very close-by: Milan always offers shows and exhibitions at International level. Mantua tells its history, its buildings, its literature festival. “There is a way of zests and scents twisting along the Garda hills. 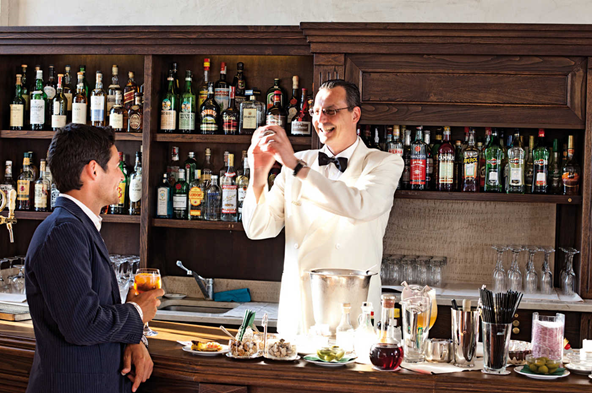 In the ancient Palazzo flavours of the tradition relive in the Chef dishes; the Sommelier enshrine prestigious wines available for you in the wine cellar. “A big vaulted ceiling, a stone fireplace. The warm and suffused lights of the Renaissance chandelier, and the romantic candles on the tables. The dining room of a country estate, where your dinner is served during chilly evenings. Behind the arched windows your eyes will linger on the golf course. 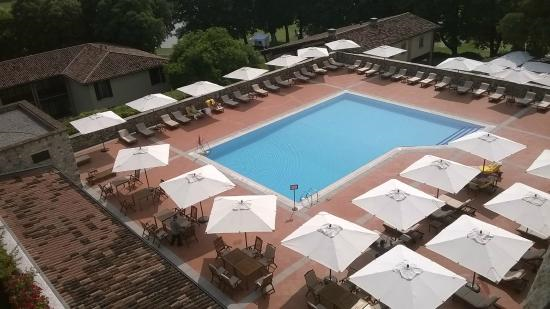 This is the perfect place for a light informal lunch during a match break, a late morning breakfast, a snack, an aperitif in the early evening served outside on the terrace in the shade of oaks. The Club House bar is open from 07:30 am until the evening (during golf competitions the opening times are extended till the end of the event). The Club House restaurant is open from 12:00 pm to 05:00 pm. 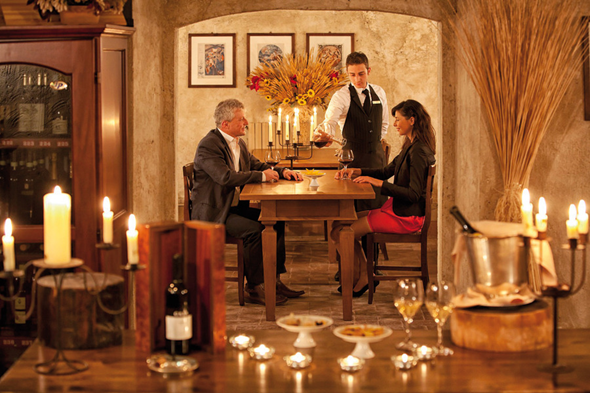 The Wine Cellar is the ideal place for a private dinner, a small event or food and wine tasting. Outside the cool air of a late Spring or an early Fall. The fire is crackling framed in a huge stone fireplace. An opened book in your hands, and a cup of tea, while you sit back on the comfortable couch for a lazy afternoon. A glass of excellent wine, whereas the sun sets and paints the countryside of red. Summer arrives, and pretty ladies come along with it.. The mansion’s activities move from the cosy indoor to the magnificent outdoor. Silence takes you along the marble and stone staircases that lead you to the upper floors, you pass under the arches, and timeless frescoes. 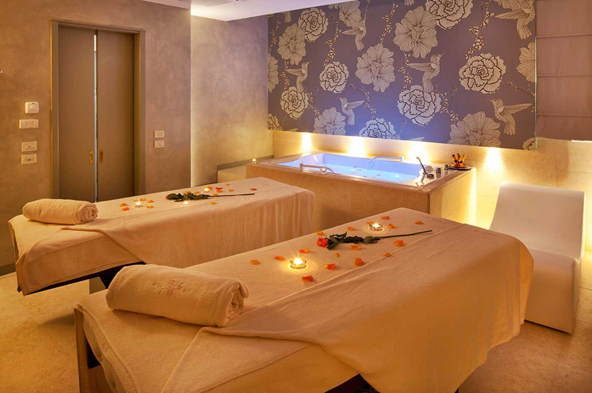 You are in the heart of Palazzo Arzaga. The windows in your room look onto green hills, drawn by the golf courses. Back on the ground floor you are immersed in a elegant countryside life-style: the inner courtyard, the restaurant, sitting around the fireplace of the bar. And outdoors, the huge terrace looking over the golf courses, where the sun sets.